Donald Trump is tweeting again. Donald Trump has his Twitter account back. (Screenshot via Twitter). He’s tweeting again. 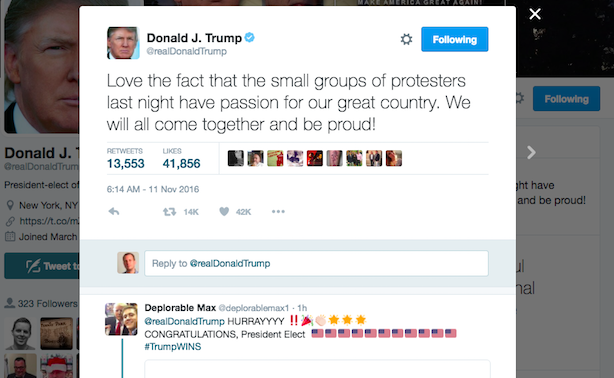 President-elect Donald Trump tweeted a swipe at protesters Thursday night, saying they are being "very unfair" and demonstrations have been "incited by the media." He backtracked on Friday morning, tweeting that demonstrators "have passion for our great country." Police in Portland, Oregon, said a Trump protest there turned into a "riot" Thursday night with clashes between demonstrators and police and 26 arrests. What a Trump White House means for the press. Political comms veterans said Trump will need a better relationship with the media once he takes office, so don’t look for major changes to the White House press corps. Journalists were more skeptical after no press pool was allowed to travel with the president-elect from New York to Washington on Thursday, as has been the case in recent transitions. And while Trump and President Barack Obama depicted a cooperative meeting for the media on Thursday afternoon, some elements, such as the warm White House greeting, were missing. The RNC’s Sean Spicer chatted with PRWeek about what he was doing on election night. Draining the swamp? Trump rallied hard against lobbyists and Washington insiders on the stump, but a number of lobbyists have already joined his transition team. Prominent lobbyists are assisting Trump as his transition team develops agriculture, energy, and communications policies. Zuckerberg sounds off on the impact of fake news. Facebook CEO Mark Zuckerberg said Thursday that fake news didn’t affect the presidential election much, though he acknowledged its News Feed product can be improved. Both Facebook and Twitter have been under scrutiny since the election over vitriolic trolling on their platforms. How CEOs are handling Trump’s win. Apple chief executive Tim Cook sent a missive to employees asking them to come together after the contentious election. GrubHub chief Matt Maloney said Trump’s behavior towards women and minorities would not be tolerated at his company, but later backtracked to say he wasn’t asking Trump supporters at his company to resign.